Picture - The Sopwith Schneider. The aircraft in the photograph is similar to the Schneider Trophy aircraft which, piloted by Howard Pixton, won the 1914 Schneider Trophy in Monaco. The Sopwith Tabloid and Schneider were British biplane sports aircraft, one of the first to be built by the Sopwith Aviation Company. The "Tabloid" was so named because it was so small, its performance caused a sensation when it first appeared, surpassing the existing monoplanes of the day. The original Tabloid, which first flew in November 1913, was a two-seater with a side-by-side configuration - unusual for the time. It had no ailerons, using wing warping for lateral rolling. It was originally powered by an 80 hp (60 kW) Gnx�me Monosoupape rotary engine and when tested by Harry Hawker at Farnborough the Tabloid reached 92 mph (148 km/h) while carrying a passenger. It took only one minute to reach 1200 ft (366 m). A total of 40 were built. On 20 April 1914, a floatplane version of the Tabloid, known as the Sopwith Schneider, powered by a 100-hp (75 kW) Gnx�me Monosoupape engine, was piloted by Howard Pixton to win the Schneider Trophy in Monaco. The Schneider Racer was sent to the production line, a total of 160 aircraft were built, with little change from the first. Attempts were made to operate Schneiders from seaplane carriers, including the HMS Ben-my-Chree, but these were unsuccessful. On 6 August 1915 a Schneider took off from the aircraft carrier HMS Campania. 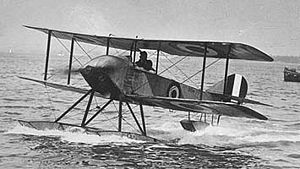 Single-seat variants of the Tabloid went into production in 1914 and 36 eventually entered service with the Royal Flying Corps and Royal Naval Air Service (RNAS). Deployed to France at the outbreak of the First World War, Tabloids were used as fast scouts. Some naval aircraft were armed with a Lewis gun on the top wing, firing over the propeller arc. One other aircraft used a Lewis gun firing through the propeller arc with deflector wedges mounted on the propeller blades. The Tabloid also operated as a bomber. On 22 September 1914, Tabloids mounted the first raid by British aircraft on German soil. In their most famous mission, two RNAS Tabloids flying from Antwerp on 8 October 1914, raided the German Zeppelin sheds at Cologne and Dx�sseldorf. The Cologne target was not located, the railway station being bombed instead, but the shed at Dx�sseldorf was struck by two 20 lb bombs dropped from 600 ft and the Zeppelin Z.IX was destroyed. The Tabloid was withdrawn from service in early 1915. Bruce, J.M. "The Sopwith Tabloid, Schneider and Baby: Historic Military Aircraft No.17, Part I". Flight. 8 November 1957. pp. 733-736. Bruce, J.M. "The Sopwith Tabloid, Schneider and Baby: Historic Military Aircraft No.17, Part II". Flight. 15 November 1957. pp. 765-766. Bruce, J.M. "The Sopwith Tabloid, Schneider and Baby: Historic Military Aircraft No.17, Part IV". Flight. 29 November 1957. pp. 845-848. Donald, David, ed (1997). The Encyclopedia of World Aircraft. Prospero Books. ISBN 1-85605-375-X. Lamberton, W.M. (1960). Fighter Aircraft of the 1914-1918 War. Herts: Harleyford Publications Ltd.. pp. 58-59. Sopwith Tabloid Pictures and Sopwith Tabloid for Sale.